Take a Good look !! 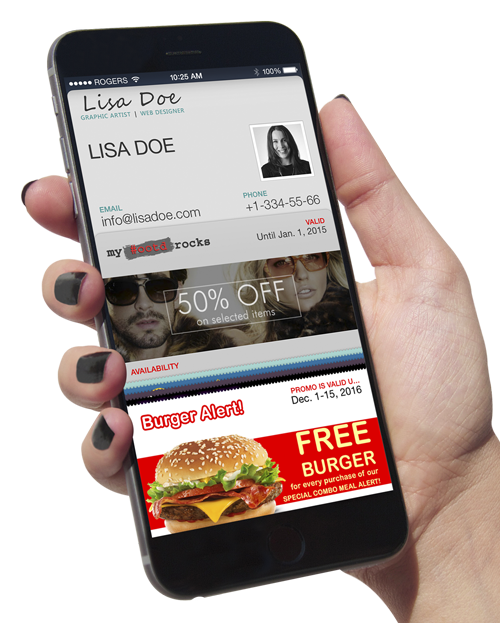 We have built the world's first true WYSIWYG pass designer so that you can create Apple Wallet (Passbook) passes even if you are not a Wallet expert. Don't know what primary fields, logo text, strip image are? No problem, you can design how the pass should look like, we handle the technical details. Use the full power of Apple Wallet (Passbook) without restrictions. Update your passes as many time as you want and send as many push notifications to your users as you like. We have built a validation service right into our Mobile Wallet service. Together with the free Pass Verifier app you can scan passes, validate them but also redeem passes or change field of the passes. You don't have to buy expensive scanning hardware. Allow your users to preview the passes before they add it to their mobile device. The preview shows a full version of the pass and can be fully used by users that don't yet have a supported mobile phone. The pass preview also allows the user to print the pass. You can share your passes using our convenient shortlink service. There are shortlinks for you templates, whenever the shortlink is opened, an uniqute pass for the user will be generated. But you can also create passes yourself and then send the user the shortlink to his personal unique pass. Keep control of what happens to your passes. With our analytics you get interesting insights into how your passes are used. We provide you an easy to use yet powerful REST API with comprehensive documentation. Our API gives you access to almost any resource of your account whether it is your templates or passes. With webhooks you have the possibility to receive information about important events, making sure that the information flow is now only one way from you to Us, but also from Us to your system.